This weekend, hundreds of thousands of citizens will march in Washington, D.C., and around the world, raising their voices to demand action on climate change, one of the most critical issues of our day. Energy and fossil fuel will be at the center of the dialogue, of course, but it’s also critical to address the reality that our industrial agriculture system—drenched in fossil fuels and sucking up energy, water, and other critical resources—is a leading climate change culprit. In fact, agriculture systems contribute at least 30 percent of global greenhouse gas emissions (GHGs). Even more stunning, use of synthetic nitrogen fertilizers on agriculture crops accounts for approximately 60 percent of global nitrous oxide emissions, a compound around 300 times more potent than carbon dioxide (CO2). It doesn’t have to be this way: A global shift to sustainable farming will not only help create a stable climate, it will also improve food and water security and safety, sustainable rural livelihoods, and environmental health. But industrial agriculture requires the production and use of toxic chemicals; converts forests, marshes, and other lands to agricultural uses; and encourages excessive tillage, unhealthy livestock-rearing conditions, and long-distance food transport—all climate-changing practices responsible for inefficiencies, inequities, and conflict the world over. Massive use of agricultural chemicals has degraded the health of our soils so significantly that crop yields have plateaued or collapsed in some regions. Scientists estimate that 50 to 70 percent of carbon has been lost in industrially farmed soils. That carbon escapes into the atmosphere, causing increased levels of CO2. It also dissolves into our oceans, causing raised acidity levels that threaten marine life and critical food systems. Additionally, after decades of intensive over-use, pest and plant diseases are becoming resistant to fossil fuel-based chemicals. On the inequity front, despite the supposed merits of our global industrial agriculture system, at least 2 billion people around the globe are chronically undernourished. And climate change further exacerbates food insecurity. Global agencies agree that crop productivity will markedly decline over the next few decades in Central America, South and Southeast Asia, and sub-Saharan Africa—regions already hard-hit by unstable food supply. Catastrophic weather related to global warming not only spikes food insecurity, but leads to national and international conflicts over resources, migration and refugees. Take for example the current crisis in Syria. Very few would utter the words “climate change” in the same sentence as “the war in Syria,” but the truth is global warming in the region played a significant role in the present tragedy. Between 2006 and 2011, more than 60 percent of Syrian territory experienced the worst long-term drought in recorded history. Water resources were cut in half. The primary wheat-growing region lost 75 percent of its crops and 85 percent of its livestock. This climate and food crisis triggered extreme poverty for millions of Syrians and massive migration from rural communities to overcrowded cities, exposing the government’s inability or refusal to help and stressing ethnic and religious tensions. However, on the climate and agriculture front, there is reason to hope. While agriculture is currently a big part of the climate change problem, it has the potential to be a big part of the solution. We can reduce or eliminate our food system’s chemical dependency—which will lower GHG emissions, rebuild healthy soils and fertility, and restore watersheds, among other benefits. We must ditch our massive monoculture approach and build resilience to extreme, unpredictable weather by bringing back crop diversity. We need to smartly reintegrate livestock into farming systems, rather than into animal factories. We need to provide economic assistance to farmers and rural communities to generate viable incomes from ecological agricultural practices. 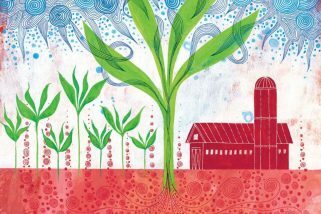 One of the most promising aspects of truly climate-friendly agriculture is found in emerging soil science that shows ecological farming can draw down carbon from the atmosphere and put it back into the soil where it can contribute to healthy, functioning ecosystems. This science is especially consequential given that scientists agree that we are beyond simply cutting back on GHGs; we must pursue “net negative emission” strategies to avoid utter catastrophe. Yes, there are challenges to transitioning away from a global warming intensive, industrial food and farm system, but it is clear that it will be at our peril if we continue on our present path. For most of this century, governments have invested billions of dollars in our fossil-fuel driven, chemically dependent agricultural model. Governments must instead invest in practices and people that promote a resilient and healthy climate, food, and water future. So let’s march. But if we’re going to get serious about curbing climate change, then we need to get serious about addressing agriculture as both a profound problem and a hopeful solution. Debbie Barker is the international programs director at the Center for Food Safety. Diana Donlon is the Center for Food Safety’s (CFS’s) Food and Climate Campaign Director where she leads Soil Solutions—a program communicating the critical importance of rebuilding soil health for food security, fresh water availability, and climate stability.